How to make Stuffed Crust PIZZA at home! - San Diego Dining Dish! How to make Stuffed Crust PIZZA at home! Ever since I began making my own pizza crust, I've been trying to figure out how to create the famous stuffed crust pizza. After lots of research (read: web surfing), I managed to figure it out! And since I love you all so much, I thought that I would share this simple, delicious recipe. Start with a non-frozen, fresh-dough pizza crust. You could use this recipe, or buy one at your local grocery. I love the Trader Joe's pizza dough in a pinch. Anyway... preheat your oven to 425 F, then roll out the pizza dough onto the baking sheet of your choice, such as a pizza baking stone. 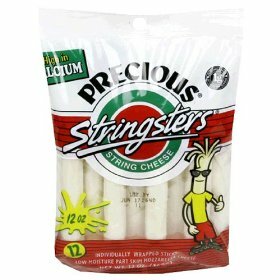 After the crust is all nice and shaped, unwrap the string cheese. If you want a super cheesy crust, use the entire stick. If you want just a little cheese, cut the stick down the middle, retaining the length. Place the cheese lengthwise onto the edges of the dough, and roll it into the crust as shown. Repeat until the entire circle has been rolled. Make sure to press down on the edges, and then brush with a bit of water to seal. Now we're ready to bake! Bake the crust for about 5 minutes, then remove and top as you normally would, then bake for 10-15 minutes, until cheese is nice and melted. This is a neat idea! I never thought to do a stuffed crust like that. I might have to try it out, thanks!